Auto Interior Shine protects vinyl without leaving a greasy feel behind. This interior shine leaves behind a pleasant scent. If your leather or dash has been faded by the sun then Auto Interior Shine is the product you are looking for. This interior protectant is easy to apply and remove. 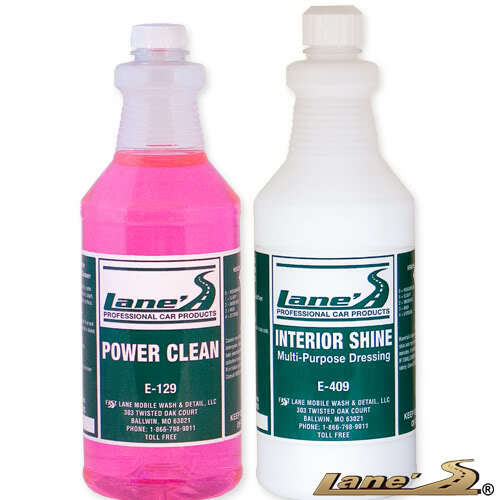 Auto Interior Shine will not leave behind an oily feel like other products sold in retail stores. Now, you can prevent your dashboard from cracking, while restoring its original color. You get a fragrance and protectant all in one, while providing the ultimate protection. Power Clean, the strongest vinyl cleaner on the market, is used by Fast Lane Mobile Wash & Detail. to clean vinyl in new and used cars. Power Clean cleans vinyl safely and effectively upon application. This concentrated vinyl cleaner will save you time, while providing you with a clean vinyl interior.